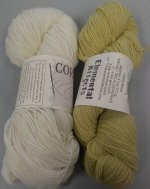 This 100% wool is spun from Cormo sheep's wool that is 100% North American sourced, processed and dyed. Each 4 oz sk features 400 yards and it is recommended at 5-6 sts/inch. It is a 3 ply, nice twist yarn that should wear well and have nice stitch definition - check back next week and I'll hopefully have some swatches knit! 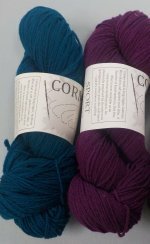 This yarn has a lot of spring to it! One skein should do a hat and fingerless mitts/wristlets. If you're interested in other 100% US/North American yarns, be sure to check out our exclusive Vermont Yarns as well as the Elemental Shetland and the Swan Island Rambouillet.